Laserblast is a 1978 American science fiction film about an unhappy teenage loner who discovers an alien laser cannon and goes on a murderous rampage, seeking revenge against those who he feels have wronged him. The low-budget film was directed by Michael Rae and produced by Charles Band, who is widely known for producing B movies. Starring Kim Milford, Cheryl Smith, and Gianni Russo, the film features notable cameo appearances by Keenan Wynn and Roddy McDowall, and marked the screen debut of actor Eddie Deezen. 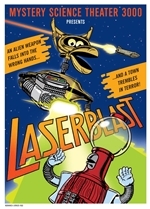 Laserblast was featured in the seventh season finale of the comedy television series Mystery Science Theater 3000, marking the show's final episode on Comedy Central before the series moved to the Sci-Fi Channel.